The original bach here at Lake Rotoma has been in our family for many years and has been renovated with a modern kitchen, bathroom and a second toilet and hand basin. A combination of wooden floors and carpeting in the bedrooms combine with an abundance of colour and style. There is a big lawn area in the front and back, so plenty of space for backyard cricket or to park the cars, boats or tents. There are 3 bedrooms inside as well as a sleepout with a King size bed and bunks.A separate storage room has an extra vertical fridge and vertical freezer, and all the mod cons are here including dishwasher, microwave, washing machine and dryer. A couple of kayaks are available for your use as well as a paddle board - life jackets are provided. The front of the bach is not fenced and there is a road between the bach and the lake. Rotoma is a special place and you will be astounded at its beauty and the clarity of its water. 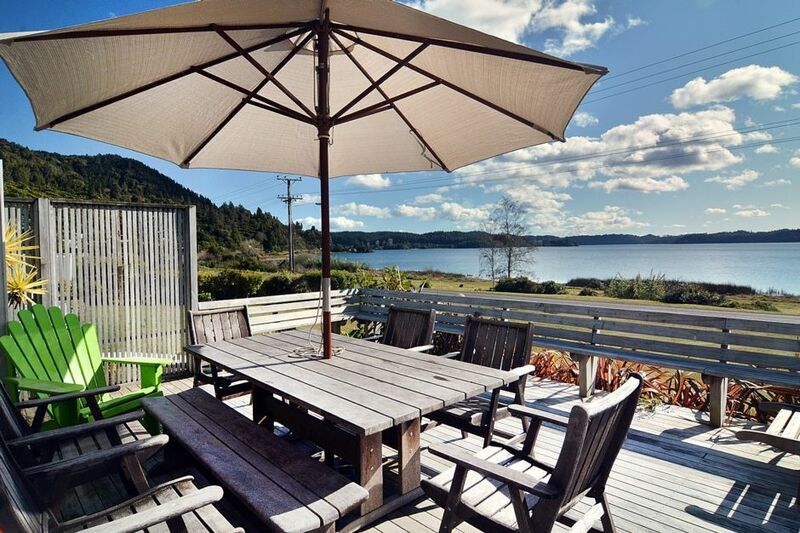 This is the perfect spot for a fishing trip, as well as kayaking, mountain biking at the nearby Onepu Bike Park, walking, horse riding or soaking in the Waitangi hot pools. Or, simply sit back on the deck and watch the sun go down. . The house was well equipped, clean and tidy we couldn't have asked for a more perfect stay in a perfect location! We were so comfortable and at home it was hard to leave we are hoping to have this house as a regular booking! Had a lovely time staying at the bach. Was just what we expected. Fully equipped kitchen and nice bathroom. Great to have the use of the paddle board and kayak. Pressure in the shower was minimal, not sure if that can be adjusted as all other water pressure was great.Would be happy to stay again. My friends and I had a wonderful time at this holiday home. It had everything we needed and a beautiful view of the lake to enjoy! Is quite far away from town but perfect for a peaceful getaway. Will definitely be returning! Property is a wonderful lake house, great layout. Property is a wonderful lake house, great layout. So chill and relaxing.